This band get formed in the beginning of 1995 and after some lineup changes managed to released a demo called Resentment of an Evanesce Aeon, which was released in early 1998. Although the band had many limitations at that time, the demo managed to grab some interests mainly due to the musical abilities of the members. The self-promotion made by the band (thousands of flyers & sending lots of promos copies around the globe) has helped them somehow. Who said you should count only on yourself ? 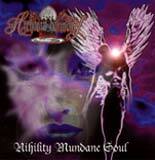 Some labels were interested and Solemn Music offered to release Archaean Harmony promo material as an official CD under the name Nihility Mundane Soul. So, what is the content of their promo material ? These talented musicians play technical black metal and they have put all the odds on their side as the production is good (Temple Studios).Now if you ask me "Is it something new and innovative ? ", I will tell you yes and no. Sometimes it reminds me Cradle Of Filth and sometimes Ancient Rites. However, I have to admit Archean Harmony is full of talent and their progressive/technical/black songs are very well balanced. First song is excellent, but a bit too long (9'00). Second and third songs confirm my first impression : Archean Harmony has a future, but they need to diminished the structure of their song (they are uselessly too long). Nice start anyway. For more info, check http://go.to/soloem or email to solemusic@hotmail.com.